Today the leaves played catch and release with their leaves…..
Look, the fall parade has started! The trees are sending down their floats of gold. With every walk I take in nature…….. I know winter is not over yet but all over there are whispers of hope. I saw bulbs coming up, maybe narcissus the other day. We have had consecutive gray days and this morning, after a patter of steady but light rain the sun came out and the birds were giving their exuberant assent back and forth across the sky. Blue sky changes things. Just a smattering of sun reminds us that things just might be okay after all. I was feeling thankful that this could bring me joy because to some in their minds all days are alike. I know this, I have seen that heartbreak. The thing that makes Christianity stand out so starkly in the climate of our world is that no matter our circumstance, the Holy Spirit lives and breathes within us and fans that flame alive even when life around us points to the contrary. Satan can fling his accusations at us all he wants, just daring us to hope. He tries in vain to pull the shutters down from inside because he knows his time is short. He will settle for a few moments of despair here and there. He has lost, my friends, and he knows it. He lost long ago on that hallowed ground where Jesus gave His Momma over to the care of Mark and forgave the world, forgave us. His last breath here was only His reentrance back Home, just as it will be for us. For those who have followed my journey here, you know I have moved back where home once was, the only home I knew. I feel a bit like Bilbo Baggins describing his “There and back again” journey. I have met my own little Smaugs. I have been job searching. Going on job interviews feels like first dates from what I can remember. I am proud of myself and my milestones lately. They haven’t found me employment yet, but they have brought me something else. A victory that has grafted into myself that no one can take away. It’s God’s and mine. And everyone that prayed for me. There was the 3 hour assessment test which I passed. And the typing test just the other day. Both times E said, just take them! And I was hoping for 45 words a minute on the typing test and I got 46! God is so generous. It was kind of surreal. It was a beautiful office and I could see other people settled happily in their suites, an architect here, a real estate office there, an attorney farther down. It was like entering another world. And I greeted the two gals at Blue Ribbon Personnel. They were well dressed and standing at their ergonomically correct workstations, like the one I had when I had a job. It was like old home week. Thankfully there were no numbers or special characters on the test. As Elaine said, Angels wings were there on the keyboards. God has birthed a new day and I am going to step out in it and see where He wants me to go next. I don’t think I plagiarized the Beatles because I added the “of.” The lyrics are how I feel right this moment. It’s been cold and I haven’t spent as much time down my the river. And I need to. It’s so easy to slip and let the world and the news, (what they say is news anyway) bog you down. I was rushing somewhere yesterday and heard a birds cry and I thought, “It’s down there, it’s all happening down there and I could be sitting on the bench watching God’s show” but then the moment passed. I confess, it’s kind of a difficult season right now. Events are happening that I really can’t write about, except in my own private journals. That hurts, because as a writer you want to write about the real stuff and when you can’t it’s like an amputation. A limb is missing and writing makes the parts grow back. Anyway, as I walked down to the river this morning I saw it just as I rounded the bend. The neighbor had lit a little Christmas tree in the room they are redesigning. My breath caught…….”There it is, a little bit of Christmas when I least expected it!” It reminded me of the time after my husband died and I was driving around town one foggy night in a stupor when I saw this little cottage on the corner all lit up with candles in each window and white lights all around and it cheered me. I never forgot it. I may not have everything I think I need in my perfect Hallmark view of Christmas this year, but I have more that I could ever want and surely more than I deserve. I have love all around me with family and friends here and a place to live that most people only dream of and a best friend who has stuck by me through everything. I pray you find the Hope of Jesus today in everything you do, in everyone you meet. May He fix what’s broken in your life and mine today, Amen. Two things I don’t know much about: Classic car engines and chess. But yesterday I learned a little about both. I learned that it’s a common thing for chess players to set up a board and wait for an opponent to show up. I had no idea. That’s so cool. I learned about these types of engines…..
We looked at cars in between ducking into some local antique shops for about two hours when we saw the little Cellar with tables that looked very inviting right on the street. It was a perfect place to rest awhile and another excuse celebrate my Birthday early. We sat there enjoying Champagne like rich people who don’t have a care in the world. (Is that ever not true!) I wondered out loud about the Cheese Shop next door, but they didn’t have anything ready-made, so Elaine ventured further down and brought back a wonderful appetizer plate with meats, cheese and crackers which was perfect. She was like an explorer coming back from an expedition. So now for the story about the Chess guy. He was an older gentleman who came walking up to the table adjacent to ours with his duffel bag in tow. He proceeded to set up his chess board in preparation for a game, as if waiting for some competition. While we were sipping and talking I asked Elaine if that was something chess people did and she said yes. Sometimes whole mini worlds open up to me that I never knew existed. I love when that happens. We noticed a young couple walk by and make a comment to the elderly man, it sounded like a throw-down to me. I kinda thought it was all in jest, but by and by they came back and the young man sat down facing the elderly man on the “white” side of the chess board. He said with a smile, “Do you remember me?” Turns out, years ago the kid’s father thought it would be a good thing for him to get his hands dirty harvesting potatoes on this farmer’s land and this elderly gentlemen was that farmer! Well, then he said his name and his eyes lit up in disbelief and ours did too. I was thinking that we were witnessing something really special. They commenced to play, but not before I snapped this photo. I will treasure it and the memory of that day. When we had champagne and cheese in the middle of the afternoon. And for a little while, all was right with the world. We had witnessed a Divine connection, what can really happen when people choose to reconnect and remember a simpler time and bring it all back to the present. I am trying to learn this: When words are few, there is a reason and a purpose for it. At least that’s what I am telling myself. There was a time not so long ago that my words poured out almost effortlessly. Not anymore. I know it’s a season I am going through and I don’t know if it will last for another month or a year or even more. I am resting in His timing, trying not to force words that aren’t there. This evening I told myself I would come out here and write whatever came, whatever sounds I heard. Just now, the sun is slipping away to another part of the world giving way to a cool evening and a colder night. I am drinking Tazo Zen tea, the kind I used to drink on my work afternoons with a drop of honey and milk. I thought that might spark something creative. The Mockingbird has stopped singing and now I hear the drowsy growl of a small plane overhead. That makes me think of fishing when I was a kid, and BBQ potato chips and a rocking boat and water lapping against the side. I didn’t really fish I just went along. I remember the sky being so very blue. It’s beautiful here now, like living inside a Haiku poem. California in Spring, especially in the foothills is very close to Tolkien’s Hobbiton. On our drive there the other day it wouldn’t have surprised me to see Bilbo and Gandalf on a stroll or sitting on the side of a hill blowing smoke rings as they puffed their pipe-weed. And the other day I found a perfect nest. I was walking up from the river and I saw a big dark object laying at the foot of the trees. I looked all over and didn’t see any baby birds or eggs, thankfully. I carried it like a trophy, it was such a marvel I didn’t know what to do with it. I wanted to preserve the miracle, for that’s what it was (is) to me. How a bird could design something so incredible and engineer something from nothing is beyond me. It’s just God, that’s all. So, my friends if you are still reading, “Good on ya!” I am thankful for anyone and everyone who has been keeping up with me on this blog. It’s a Grace journey we are all on. Along with Thomas Merton, I believe that everything we go through here serves some kind of purpose. My tea has gone cold in the mug and the mosquito’s are out. I wish the bats would come and eat them all. It’s about time for them to come out. The birds have gone quiet now, all tucked away on their secure boughs. Time to go for now. Evening falls once again…….It is well with my soul even when words don’t come. I used to talk to you God, and tell you everything. I used to enjoy the glow of Your Presence in prayer and while sitting in silence. I used to feel your Spirit leap for joy within me while out running and listening to music, or even doing simple chores like vacuuming. What’s different now? Is it me? Am I doing something wrong? I feel as if a scoop of something has been taken from my soul and I want it back. When God seems distant, maybe He is asking you me stretch my faith. Maybe it’s just that easy. He wants me to ride it out, knowing that the Bible assures me that others have gone through these times as well. I can rest in my assurance that God hasn’t gone anywhere. How long Oh Lord? Will you forget me forever? How long will you hide your face from me? How long must I take counsel in my soul and have sorrow in my heart all the day? But David knew His God. Though His feelings were valid; people were searching him out to take his life after all, He knew in His heart he was not forgotten. Listen to what he says in verse 5. He had the key to success. He drew from the well of experience and memory and remembered all the times God had been there and he knew that God hadn’t changed. Can it be that it’s as simple as continuing to draw on all those answered prayers, all those times of closeness? More importantly, that God is who He says He is and will never leave His children behind. This morning as I stepped down my little road to the prayer shack, I heard not one but two owls calling back and forth. Thank you God, that’s a gift. Another gift He presented me with was the honor of having my photos shared on another blog today. I never expected that and it was a very good day to start my day. You can see them and also have the pleasure of some wonderful works shared by the talented Glynn Young here. I am grateful this moment as I type these words. The sun is partially shining today and that’s another blessing. We have waited all week for this. Maybe today I will go the used Bookstore and turn in my CDs and get a little credit. It’s a good day God. I thank You for it. I rest today in Your sovereignty, Your love, Your gracious Presence. This daughter loves you. 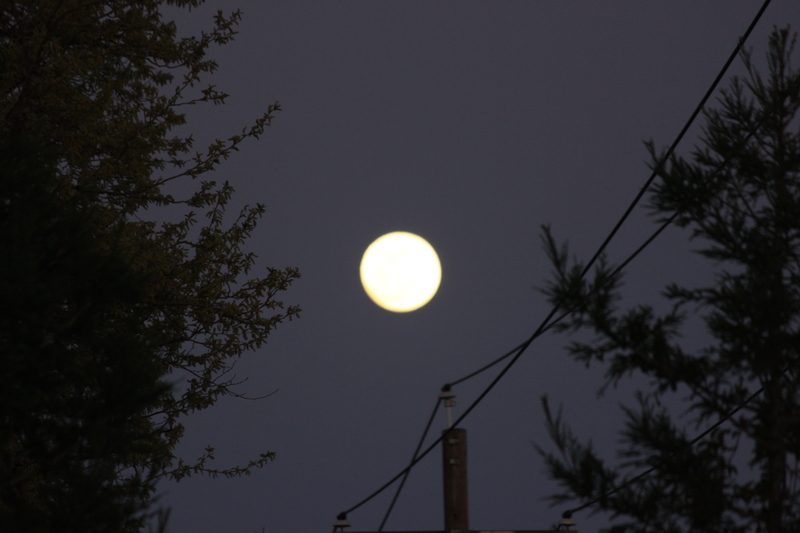 It’s growing late….earlier I watched stars shyly make their sequined appearance one by one in the cobalt sky. Humans and animals alike have settled into deep breathing for the rhythm of the night has caught us all. The house creaks, and the events of the day flutter, collect, and float down and gather at my feet coming to greet me again here in my quiet chair. I smile, for it was a good day. Soon all the lights will go out for me and I will say a prayer and talk to God unless I fall asleep first. Later, in the deep dark when it’s morning but not quite morning, worry will come to find me. But I am ready for it. I have the 23rd Psalm. Let us live in this love and this happiness, you and I and all of us, in the love of Christ and in contemplation, for this is where we find ourselves and one another as we truly are. It is only in this love that we at last become real. For it is here that we most truly share the life of One God in three Persons. Thomas Merton, A Book of Hours. Usually, you just don’t need that many words……..I am finding that out. The more I write, the more I realize that to be a good writer, you need to be an even better editor.